For the 2017 film adaptation, see First They Killed My Father (film). 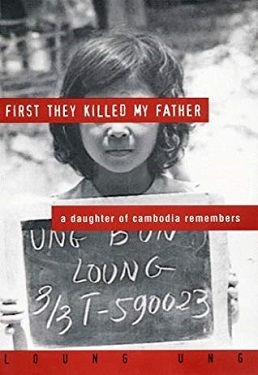 First They Killed My Father: A Daughter of Cambodia Remembers is a 2000 non-fiction book written by Loung Ung, a Cambodian author and childhood survivor of Democratic Kampuchea. It is her personal account of her experiences during the communist years. Until the age of five, Loung Ung lived in Phnom Penh, one of seven children of a high-ranking government official. She was a precocious child who loved the open city markets, fried crickets, chicken fights and sassing her parents. While her beautiful mother worried that Loung was a troublemaker—that she stomped around like a thirsty cow—her beloved father knew Loung was a clever girl. When Pol Pot's Khmer Rouge army stormed into Phnom Penh in April 1975, Ung's family fled their home and moved from village to village to hide their identity, their education, their former life of privilege. Eventually, the family dispersed in order to survive. Because Loung was resilient and determined, she trained as a child soldier in a work camp for orphans while other siblings were sent to labor camps. As the Vietnamese invaded Cambodia and overthrew the Khmer Rouge, the surviving siblings were slowly reunited. Bolstered by the shocking bravery of one brother, the vision of the others and sustained by her sister's gentle kindness amid brutality, Loung forged herself a new life. The book was criticized by Bunkong Tuon for being inaccurate and, therefore, not being useful for historical research by Sody Lay, an American Cambodian reviewer. Reflecting on this negative review, Bunkong Tuon considers Sody Lay's review right and, at the same time, defends the memoirs as an emotional truth instead of a historical truth. The book has been adapted into a movie that was produced and directed by Angelina Jolie. The film premiered on February 18, 2017 in Siem Reap, Cambodia. "The heart of it is Loung's story", Jolie states on the film. "It's the story of a war through the eyes of a child, but it is also the story of a country". To construct an accurate portrait of the genocide and war, Jolie used only Cambodian actors who speak their native language, Khmer. She gathered hundreds of survivors and their children to re-create their stories. The movie was filmed in Cambodia. ^ "First They Killed My Father (Ung)". LitLovers. Retrieved 9 April 2015. ^ Tuon, B. (5 June 2013). "Inaccuracy and Testimonial Literature: The Case of Loung Ung's First They Killed My Father: A Daughter of Cambodia Remembers". MELUS: Multi-Ethnic Literature of the United States. 38 (3): 107–125. doi:10.1093/melus/mlt032. ^ "Angelina Jolie Pitt to Direct Netflix Original Film 'First They Killed My Father'". Wall Street Journal. Retrieved 25 July 2015. This page was last edited on 9 January 2019, at 02:21 (UTC).